The Maison. Elegance and refinement. Property 2: The Maison. Elegance and refinement. Enchanting Villa - Old Country House in magic ancient olive grove. Property 9: Enchanting Villa - Old Country House in magic ancient olive grove.
' 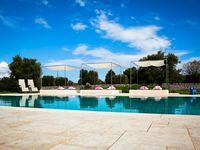 Trulli the Castagno': trulli holiday homes with wide swimming pool in the heart of Valle d'Itria - Trulli house "Il Ciliegeto"
Property 22: ' Trulli the Castagno': trulli holiday homes with wide swimming pool in the heart of Valle d'Itria - Trulli house "Il Ciliegeto"
Trulli in Valle d'Itria with pool and pinewood with hammocks ....... a fairy tale! Property 36: Trulli in Valle d'Itria with pool and pinewood with hammocks ....... a fairy tale! Spacious Villa with Large Pool in 2.5 acres. Property 45: Spacious Villa with Large Pool in 2.5 acres.
' 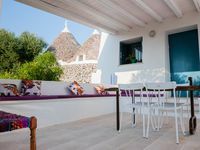 Trulli the Castagno': trulli holiday homes with wide swimming pool in the heart of Valle d'Itria - Trullo house "il Panoramico"
Property 47: ' Trulli the Castagno': trulli holiday homes with wide swimming pool in the heart of Valle d'Itria - Trullo house "il Panoramico"
Luxurious Villa with Large Pool and Beautiful Garden. Great Location. Property 48: Luxurious Villa with Large Pool and Beautiful Garden. Great Location.
' Trulli the Castagno': trulli holiday homes with wide swimming pool in the heart of Valle d'Itria - Trulli house "degli Archi"
Property 49: ' Trulli the Castagno': trulli holiday homes with wide swimming pool in the heart of Valle d'Itria - Trulli house "degli Archi"
Met 6 volwassenen en 2 kinderen hebben we de herfstvakantie gevierd in het prachtige huis van Ian. Het huis is comfortabel en mooi ingericht. Ian heette ons welkom( er stond een welgevuld welkomspakket klaar). De huisbewaarster, Maria, was ook vriendelijk en reageerde snel op onze vragen.We hebben een heerlijke week gehad in Puglia , mede door het mooie huis! Veel dank aan Ian !